Mark Twain once said, “New Year’s is a harmless annual institution, of no particular use to anybody save as a scapegoat for promiscuous drunks, and friendly calls and humbug resolutions.” Although there isn’t much evidence to dispute such a claim, perhaps it’s time to create some. 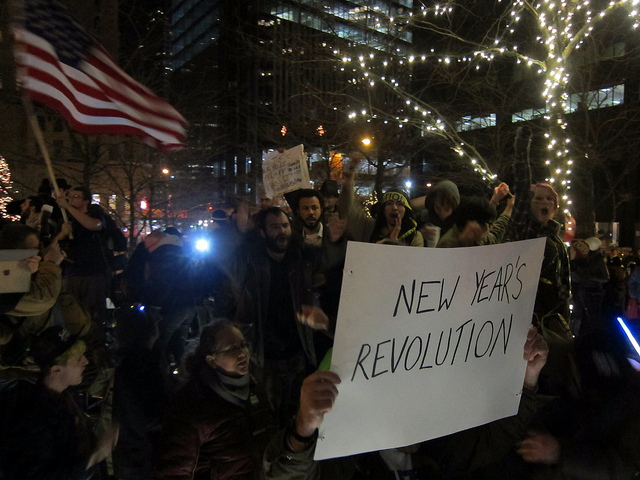 With that in mind, we decided to reach out to some truly bold social movement thinkers and ask for their revolutionary resolutions — the things they are most looking forward to in their own work for the coming year, and what they hope can come from people-powered struggles for justice in 2013. May these offerings spark your own imagination and help you ring in the New Year with some dangerous ideas for a better world. “To use the signs of climate change I experience daily not as a motive for depression but as a basis for connecting with other people. To hold up the possibility of common preservation in the midst of mutual destruction.” – Jeremy Brecher, author of Save the Humans: Common Preservation in Action and Strike! “I ended 2012 with a peace pilgrimage to Afghanistan, a powerful experience where I witnessed the horrors of war and poverty, but also the hope of the Afghan Peace Volunteers, a beautiful group of young people committed to nonviolence. In this New Year, I’m interested in plumbing anew the inner spiritual depths of peace and nonviolence in the midst of my activism and public work, that I might discover deeper causes for hope. Can I become more a person of prayer, and discover the connections between the inner work of disarming the heart and the public work of disarming the world? Dare I push the mystical boundaries of peace, and engage a new kind of dangerous holiness that threatens war, empire, corporate greed and nuclear weapons, and so radiate a universal, compassionate, forgiving, nonviolent love for everyone, and remain centered in the eternal present moment of peace? That kind of peacemaking, I believe, is spiritually explosive, globally revolutionary and astonishingly hopeful, and I find it the highest goal worth seeking.” – Rev. John Dear, activist and author of 30 books on peace and nonviolence, most recently Lazarus, Come Forth! Churchill is reported to have declared that “History is written by the victors.” How the history of the Arab Spring is written will have a profound effect upon the future of nonviolent struggle and the type of action used to conduct future campaigns. It is possible that 2013 will see the field locked in a battle of analysis over how the victories and losses of recent years have come about and whether these events have led to positive changes for the societies in which these struggles were waged. A victory for strategic nonviolent struggle on the ground could be rolled back by the lack of careful analysis and documentation of the events based on historical reality. Access to information about the requirements for success of nonviolent struggle can help people understand past struggles, and help to make future ones more effective. The Albert Einstein Institution is looking forward to expanding its programs and activities this year in order to contribute to increasing that knowledge and understanding. – Jamila Raqib, Executive Director, The Albert Einstein Institution. you are a victim of a hurricane, tornado, or major storm. company. This is the number one computer game gadget for a reason.